Hey guys! Have you ever wondered what the heck a crudité and/or a charcuterie platter is? 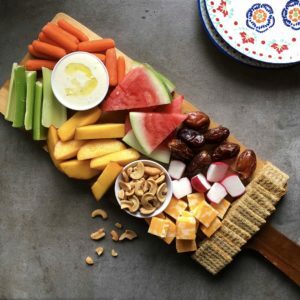 It’s basically a platter topped with an assortment of fruit, vegetables, olives, deli meats, bread, dips, crackers and cheese! The term crudité is often used when making a vegetarian platter and charcuterie is mainly a variety of sliced meat. 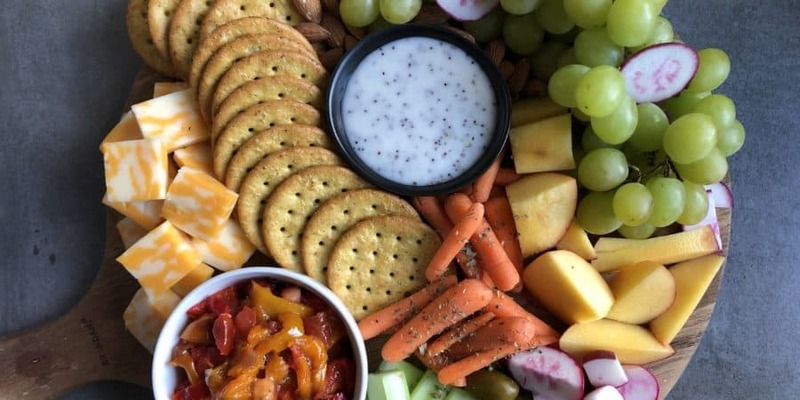 Today, I’m having a friend over and lately my go to when having company is to make these platters. Let me tell you why. You can prep it hours ahead of time; you are able to clean out your fridge and pantry a little bit, and as the host, you get to sit around and enjoy too since everything is already prepared on one beautiful platter. I love serving these fresh platters of goodness because not only are they healthy but there is always something for everyone. 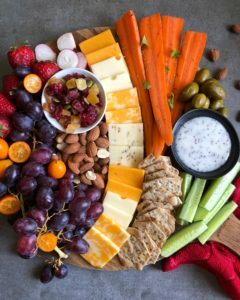 So, I wanted to give you some tips to make your very own platter at home for your guests. Now, I am no expert but I think I do a pretty good job! You need some sort of large platter or board to accommodate all the ingredients. You can even use a wood cutting board. Pick fruits and vegetables that are in season (They are more likely to be tastier and more vibrant in color). I love using carrots, radishes, Persian cucumbers, stone fruits, grapes, berries and so much more. Take a look at your pantry and fridge before purchasing anything. Often, we have all the ingredients needed to make these gorgeous platters in our home. Always include some sort of dip for the vegetables such as hummus. Maybe include a splash of olive oil on the dip to grab the eye more. Include at least 2 vegetables and 2 different fruits so there is variety. You can place some rolled up sliced deli meats with pieces of fresh bread to add a special touch. Cheese and crackers are a must. They go perfectly together. I like to purchase blocks of cheese and cut them into cubes or you can use feta or brie. To stay fresh, prep no more than 2-3 hours ahead of time and keep it covered till serving. Mix and match the colors and textures of the ingredients when displaying. Keep some veggies and fruits whole and others sliced to show variance. Last but not least, have fun with it!!! Let your creative artistic side come out and just enjoy 🙂 Your guests will be flattered and wowed either way!